Mr. Media is recorded live before a studio audience of bad guys who, when they see former Chicago cop Dennis Farina coming their way, start thinking about mending their ways… in the NEW new media capital of the world, St. Petersburg, Florida! Download The Last Rites of Joe May, starring Dennis Farina by clicking the movie poster above! Dennis Farina is an impact guy. When this prominent actor hits the screen, no matter what the role, he owns it. I don’t know what he’s like in real life, but in TV and films alike, he’s always bigger than life. 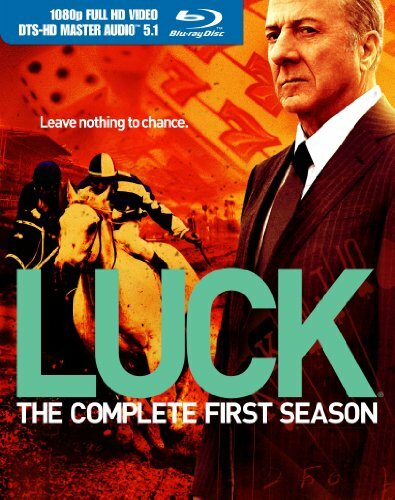 Order ‘Luck: The Complete First Season’ [Blu-ray] starring Dustin Hoffman and Dennis Farina, available right now at a great price by clicking on the DVD above! And that’s what makes this Law & Order veteran’s work in The Last Rites of Joe May so compelling: he’s small. Life has just beaten the small time hood up and down so many times late in life that while we see a Dennis Farina character who still projects confidence in himself, inwardly, he’s just about had enough. When he returns to his apartment after a lengthy hospitalization only to find a naked woman in his shower, things seem to be looking up. But when he finds out it’s no longer his apartment, it’s hers, well, welcome to The Last Rites of Joe May, indeed. Check out the trailer for The Last Rites of Joe May and you’ll see what I mean. You can see all of The Last Rites of Joe May from the comfort of your own home via Movies on. It is also available on iTunes, Amazon and Vudu and watch for its theatrical release in New York and elsewhere soon. And don’t miss Dennis Farina in the new HBO horse racing series, Luck, co-starring Dustin Hoffman, Nick Nolte and Joan Allen, beginning in January 2012.